Get the Coastline Courtesy Treatment!Expert awning installations, affordable pricing & personal service. Coastline Awning has been Central and Northern New Jersey's exclusive dealer of Sunesta Retractable Awnings and Screens since 1981, though we have been selling and installing awnings since 1976. We are a family owned and run business, committed to providing our local community with courteous service, the highest quality retractable awnings in the industry, fair pricing, on-time delivery and expert installation that is second to none. We offer the entire Sunesta Awning and Screens product line including retractable awnings, retractable screens, window awnings, door awnings, stationary awnings, awnings for commercial use and more! Whatever your outdoor design dreams are, we can meet and exceed your expectations with our custom made awnings and screens. Sunesta products are built to last using the finest in German engineering and weather tested fabric. All our awnings and screens are made with 100 percent solution-dyed synthetic fabric, so they are resistant to fading from sun exposure and the growth of mold and mildew. We offer a variety of colors, patterns, and fabrics to match any space's décor. 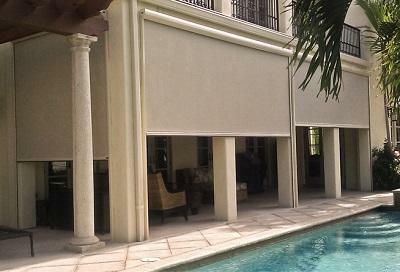 With our custom made awnings and screens, any outdoor space can quickly be turned into a private oasis! Coastline products proudly offer the best warranties in the industry. If you are not happy with your awning or screen simply give us a call and we will fix any issues right away. Make the most of your outdoor space. Our retractable screens make a lovely addition to any outdoor space - providing shade as well privacy when needed. At Coastline Awning we offer more than just awnings. We also offer high quality retractable screens to enhance the comfort of any outdoor patio, pergola, sun room, or other outdoor space. On top of superior sunlight and UV ray protection, our retractable screens can be lowered to provide ample privacy when needed, and then retracted to open the space in less than a minute. Our screens are perfect for both residential and commercial use, and are able to be installed with no evasive construction. Coastline Awning also offers expert commercial awning and screen installation to upgrade the look and function of your New Jersey business or industry building. No matter what your business is, a beautiful awning or screen system enhances customer experience while also providing much needed sun light and UV protection in outdoor social or work areas. We custom design all our awnings and screens to fit the exact needs and wants of the business owner. We work with customers hand in hand through the entire design and installation process, so you can trust your end result will look exactly as you envisioned. Get Your Free Retractable Screen or Awning Cost Quote Today! Create your own oasis. Custom made shade where you need it to enjoy the views you love. No matter what function you need your retractable awning or screen to have, Coastline Awning has the experience and expertise to design and install whatever you have in mind! Give us a call at 1-732-940-4151 or contact us online to schedule you free, on-site estimate today!